This is the content for entry level people who are looking to create Gmail account first time ever. As a newbie you can thin May it is difficult to create Gmail account but it is not that at all. 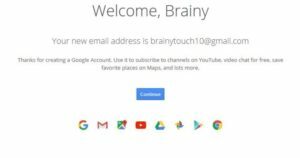 I am going to show you a step by step guide on how to create a Gmail account easily: Just below step and enjoy all the feature of Gmail or Google account. You will see below page. In the above page fill up all the detail according to requirement. Also, put our phone number in the certain box. If you see it show different country then select your country from the option. You have to choose a username which is not in use of other people. No worries, they will suggest some user while you are creating a Google account. From that step, you can edit your personal information and you can add more security to protect your account from Sign In and security options. This very eases just what you need to do click on there and the fill up the required information as you like. 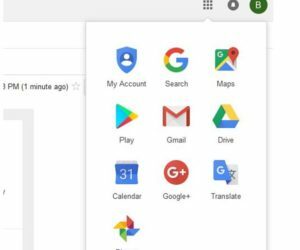 Already you have seen the exciting feature of Gmail or Google account. You can use map, search, and translate as well as Google plus social platform. More importantly, you can store all your important data in Google drive safely. There is no chance of being lost. 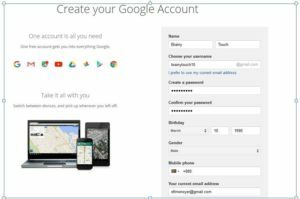 A Google account can make your life more comfortable. This is very effective to save your time. If you use Google calendar then it will keep knocking you important word of a day. 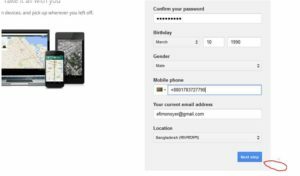 After reading this article you can create Gmail account easily.